Microcontrollers use pins for interfacing with the outside world. In general, the pins are the physical points on the package of an integrated circuit (IC) where a connection can be made to the printed circuit board. Behind each pin (inside the IC) there is a special circuitry used for driving it. This circuitry (usually called a pad) can be configured to allow the pin to interface with different types of digital and analog circuits. Choosing the proper pin configuration is an important part of designing an embedded system. In this article, we will cover the most common types of output configurations and their applications. High impedance (High-Z, Hi-Z) pin -A pin that is characterized by having a high impedance which effectively removes its influence on the electrical circuit it is connected to. It is not actively driven and is “floating” unless another external device or circuitry (pull-up/pull-down) is driving it. Floating pin – A pin is “floating” if it is left unconnected and is also not driven by a circuit inside the integrated circuit. Its voltage level is undefined and unpredictable. A high impedance pin that is not driven by a pull-up or pull-down circuit is said to be floating. Pull-up and pull-down resistors – These resistors are used to set a specific level (logic 0 or logic 1) at a floating pin. A pull-up resistor is connected to the power supply so it can pull the floating pin to logic high level. A pull-down resistor connects the floating pin to the ground (logic 0). Push-pull is the most common output configuration. Just as its name suggests, push-pull output is capable of driving two output levels. One is pull to ground (pull/sink current from the load) and the other is push to power supply voltage (push/source current to the load). The push-pull output can be implemented using a pair of switches. The practical implementation in an integrated circuit involves the use of transistors. In Fig. 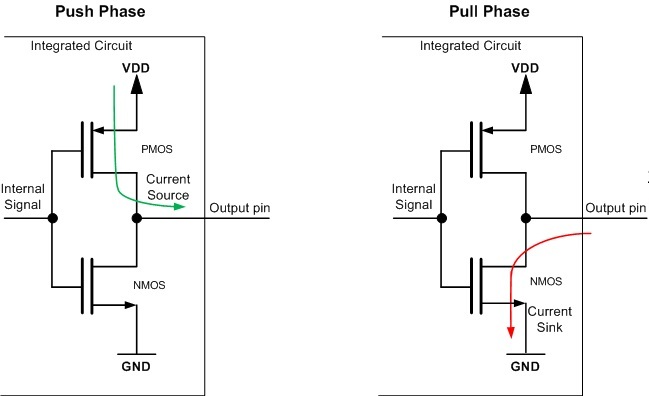 1 we can see a push-pull output implementation using a PMOS and an NMOS transistor. Shown on the left side is the operation during the push phase and on the right side is the operation during the pull phase. Push phase – When the Internal Signal connected to the gates of the transistors (see the figure above) is set to a low logic level (logic 0), the PMOS transistor is activated and current flows through it from the VDD to the output pin. NMOS transistor is inactive (open) and not conducting. 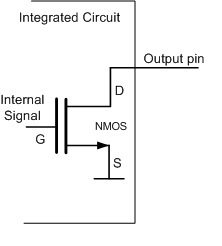 Pull phase – When the Internal Signal connected to the gates of the transistors is set to a high logic level (logic 1), the NMOS transistor is activated (closed) and current starts to flow through it from the output pin to the GND. At the same time, the PMOS transistor is inactive (open) and is not conducting current. This type of output doesn’t allow connecting multiple devices together in a bus configuration, like the open drain output. Push-pull configuration is most commonly used in interfaces that have unidirectional lines (transmission on the line is only in a single direction – SPI, UART etc.). As push-pull outputs are constantly driven (high or low), they provide better performance when it comes to the slopes of the generated output digital signals. It should be noted that an output pin configured as push-pull can in most cases be dynamically reconfigured to become an input. This is achieved by closing both of the transistors, thus achieving high impedance state on the line. Then the line can be driven from other external devices and sensed with dedicated logic inside the integrated circuit. In open drain configuration, the logic behind the pin can drive it only to ground (logic 0). The other possible state is high impedance (Hi-Z). The implementation involves the use of a single transistor. If its drain terminal is open (the device is off) the pin is left floating to Hi-Z state. Driving it to high logic level requires the use of an additional circuit or component. In most cases, an external pull-up resistor is used (there are microcontrollers that provide internal pull-up resistors for open drain configurations). On Fig. 2 we can see an open drain output. It is implemented using an N-channel MOS transistor that pulls the output pin to ground when the transistor is on and leaves it floating when the transistor is off. Open drain outputs are most commonly used in communication interfaces where multiple devices are connected on the same line (e.g I2C, One-Wire etc.). When all of the outputs of the devices connected to the line are in Hi-Z state, the line is driven to a default logic 1 level by a pull-up. Any device can pull the line to logic 0 using its open drain output and all devices can see this level. Rising edge slope – The pull-up resistor in combination with the inherent capacitance of the line forms a low-pass filter. 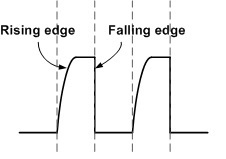 Depending on the value of the resistor and the capacitance of the line there can be a visible difference in the slopes of the rising edges compared to the falling edges. The falling edge is sharper as it is achieved using the transistor which has very low internal resistance. The rising edge, however, is formed by the pull-up resistor and the aforementioned low-pass filtering effect is more pronounced. Power consumption and noise interference – A trade-off exists when choosing the value of the pull-up resistors. When a device on the line drives logic 0 level, it will cause a higher current to flow through pull-up resistors with lower values and this will increase the power consumption. However, choosing higher valued resistors will, in turn, cause a lower current to flow through the resistor and this will make it easier for external interferences (noise) to be picked up on the line. Open drain output has higher power consumption during active transfers due to the pull-up resistors that are used. In general, the push-pull output has faster slopes than the open drain output.